The United States of America today expressed strong condemnation on the recent deadly terrorist attack by Al-Shabaab militants on Somalia’s parliament. According to media reports, the attack killed at least 10 people and injured at least ten others. Militants stormed the facility in the capital of Mogadishu and launched a killing rampage using automatic rifles, heavy machine guns and explosives in the attack. The deadly attack lasted for three hours. 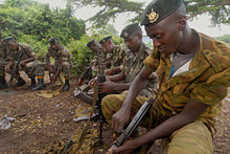 Burundian troops preparing to deploy to Somalia, 2006. In a press statement in Washington DC, Deputy Department Spokesperson Marie Harf condemned the attack and expressed deep sadness over the loss of lives as the terrorist group went on a deadly killing rampage again in the African nation. The world body’s head, UN Secretary General Ban Ki-moon and the UN Security Council voiced strong condemnation of the terror attack on the Somali parliament. The UN leader conveyed the support of the world body’s support to the Somali people, their Government and their parliament, as they work for peace and stability. Records of terrorism have hunted the African country for many decades. Last year, Al Shabaab gunmen in the capital Mogadishu used a car bomb to blow a hole in the U.N. compound’s wall. Twenty people, including U.N. staff, were killed in the incident. In another incident, al Shabaab attacked a U.N. convoy with a remote-controlled bomb earlier this year. The attack killed at least seven Somalis. Fighting between Somalia’s Transitional Federal Government (TFG) and Al-Shabaab militants had already uprooted tens of thousands of people in Mogadishu before the current humanitarian crisis began. Ongoing insecurity and drought, as well as famine in parts of southern Somalia, have caused a massive influx of starving adults and children into the city in the past two months. Al-Shabaab militants are infamous for deliberately blocking the delivery of food assistance in an area of south central Somalia which is under direct or indirect control of al-Shabaab. The Al-Shabaab militant group has been compared with the Taliban in Afghanistan and Pakistan because of its opinions and beliefs.